The adorable and funny Chi returns for a 2nd season. It's a continuation of a light hearted story about a little stray kitten who found her place in a Japanese family. This little guy gets into your usual mischief you would expect from a little kitten. For fans of the series, you still have the same spirit of animation and characters in this 2nd season. New viewers can even jump on to enjoy short 3 minute amusing episodes. Most of the scenes are seen in Chi's aspect of the world, but occasionally viewing into the Yamada family daily life of the individual characters. For new viewers, the setup is similar to what the US comic Garfield is. You have a cat that is able to talk to other cats, but human characters can't understand the animal language. Also replace Garfield's personality with a personality of a 5 year old, and toss it into a Japanese apartment where pets are not allowed. It picks up from where the anime season 1 left off. Reading the new title "Chi's New Address" you can assume they will be in a new house. First few episodes picks up quite well even for new viewers that does not know what is going on. You'll find the same background music they have used in season 1, and maybe some remix. In episode 3 there's an odd choice of bgm which seems a bit distracting to me. The music is really simple, and usually light which fits the situation most of the time. Nothing has changed about the original characters. Chi is still the playful and curious kitten. The Yamada family, who have grown to love this little kitten as part of their family, are still spoiling her beyond any reasonable means. Beyond that, the introduction to many new characters comes later on, from animals characters to human neighbors. Keeping the spoilers to minimum, all I can say is they keep in the same spirit of the animation. It uses background action scenes a lot when Chi plays around, such as dreamy backdrops for happy scenes or dark blue backdrops for scared or lonely scenes. Also a lot of emotes such as sweat drops, blue face, and so on. It's really simple and keeps in the same spirit of the first season. As a cat fanatic, my favorite thing was that Chi reacts like a cat would. Freaking out during a move, marking the new apartment thoroughly before she can relax, trying to figure out a pet door. This is truly a slice of life anime from a cat's perspective, And it's great for bringing on a smile. The episodes are 3 minutes, so you'll probably get sick of the opening, but I couldn't rate it down for that because Chi is adorable. chis sweet hooooome!! its very advantural anime abt small moody funny kitten lost her mum & met with yohei & his small family they get along very quickly & chis life start to b almost wonderfull that she 4get abt its mum!!!!! this anime MUST WATCH!!!!!! "i fell in love with chis after i watched the 1st ep" ^^ im a cat lover! This is one of the cutest, and best anime shows I've ever seen. Even though it looks to be a show for little kids, it's still got a great sense of humor. I think Chi's voice is great, and I love the animation done for this show. It's always a refreshing reminder to see that great things can be done for all to enjoy. This is what you call CUTE! I loved this series. Yes, it is the second series of Chi's Sweet Home, but it is still awesome. Yohei: Chi and Yohei have a special bond. They love each other! Mom & Dad: Chi tortures them XD, not on purpose though. She plays around and tracks in mud, scratched up the furniture... etc. There are lots of other characters but i don't wanna spoil it! Review of series called Chi's Sweet Home. The cat simply adorable and acts like a three year old. The family that owns this cat spoils it beyond belief.in the first season they live in an apartment that does not allow cats BUT in the second season i believe that they move to a new apartment that allows pets. The backstory between this family and the cat is very touching . Surprisingly, they did not buy Chi at a pet shop. Instead They found her and took her in. Sadly this anime has come to an end or so i think but i have no seen a new episode for about a year. I believe that it has ended (so let's just assume it is) but even though i am sad that it is not airing any more I still found it very entertaining when i would watch in my free time. Chi's sweet home has reminded me that anime can be very nice and innocent as well as they can be very bloody and horrific. This anime would be very nice to watch when trying to blow off steam and you start to feel like a three year old, totally happy with no cares in the world. I believe that anyone who who wants a good laugh every once in a while should watch this and yes every once in a while it does seem stupid or kind of sad but it can seem very heart warming as well. Best Cat ever that Is all. Short and Sweet, I love Chi's Sweet Home!! This show has me pumped. Each episode is 3 minutes long, the animation is cute, the characters are cute, and the art is like a charming children's book. 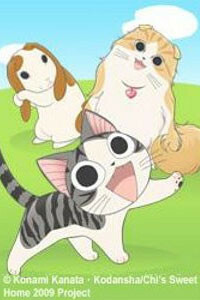 This anime is a slice of life about a little kitty named Chi, and the home she lives at. It deals with her life at home with her family, her neighbors, and her fun adventures along the way! It also really puts your perspective into Chi's eyes and how a cat would really see and think things. If you're an avid cat person like I am, this show is perfect for you. It's great for kids to watch too, and perfect for those with short attention spans. The other animal characters introduced are all really cute and funny too, and each one is special just like Chi. I love this show and will continue to watch more! A heart-warming story of a kitten's daily adventures and its owner family.